by “losers” I mean those who did NOT win the Cbus Pedal Wagon Party that was raffled off on ColumbusBestBlog.com in August 2013. Caryn was the winner of that party. Cbus Pedal Wagon Facebook page. Today. Do it today before it is too late. Name the Pedal Wagon. Get your friends to comment with a name (on the CBus Pedal Wagon Facebook page) too. They’d include you in their Pedal Wagon Party wouldn’t they? Those who did not win sounds a lot nicer than “LOSERS” doesn’t it? And of course that is what I mean. Caryn won the prize in August from Columbus Pedal Wagon, a two hour outing with 14 of her friends. Caryn and her friends did their Pedal Wagon Party really quick. I wanted to go take a few photos but I could not. I know Caryn is a fan of the Pedal Wagon… as are her friends. The Pedal Wagon seats 16, a driver, you and 14 friends. 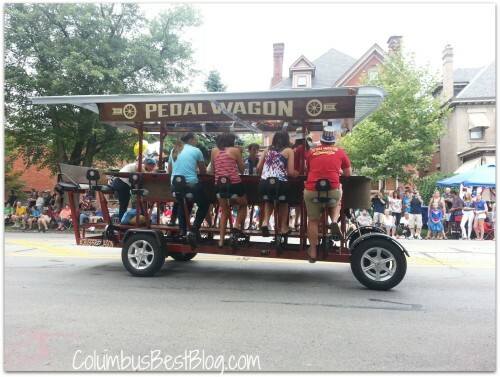 You do not drink on the Pedal Wagon… even if it looks like a bar on wheels…. you know open container laws but a pub crawl is a popular way to party on the Columbus Peddle Wagon. What are you doing hanging out here? Get to the Facebook page and name that Pedal Wagon.